Last Thursday I got to meet my friend Vine as he was heading through on his way to Blogorado. We stopped for some burgers and beer and chatted for several hours before he set off again. He’s a great guy and I really enjoyed getting to know him. On Saturday, I met TD, another real great guy, and Carrie, who is sweet as pie, at the airport. After stopping for lunch it was time to caravan down to Blogorado. We made excellent time and arrived in time to check in to our rooms and rest a bit while we waited for folks to return from the range. Refreshed, we headed over to Mamaw’s to meet FarmGirl, FarmMom, FarmDad, Gay_Cynic, OldNFO, Singray and LabRat, AEPilotJim, Ambulance Driver, MattG, JPG, Phlegmfatale and LawDog, Peter and Wing, Vine and Oleg. We all enjoyed some of FarmMom’s Chicken Fried Steak and Stingray’s delicious NerdBeer. I was sad to hear AEPilotJim had to head out for a flight, but it was great to see him again. Everyone gathered round and with such a great bunch of people it was easy to float from group to group and the conversations easily flowed late into the night. 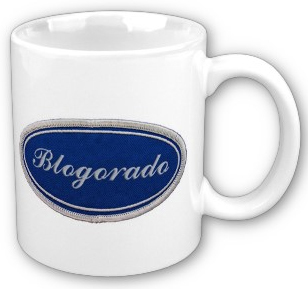 My Blogorado patch on a mug or t-shirt! I know you want one. FarmGirl has set up a Blogorado Zazzle site featuring Blogorado inspired graphics from Sci-Fi and your’s truly. Proceeds benefit Blogorado 2010, so the more you buy, the more scrappy nibbles! Click for full-size. Also available with white background. Sunday morning, Snarky knocked on my door to tell me we were meeting for breakfast a little earlier that planned. We went over the restaurant where I met MattG and JPG, who had arrived earlier that morning. I was astounded to see that along with everything else this weekend, FarmFamily had managed to get Miley Cyrus to be our waitress for the morning! I tell you there’s nothing these folks can’t do. After everyone ate and talked for a bit more, I had to say my goodbyes and head back home as the Newt had been sick all weekend and I wanted to get back in time to give DD a break. On the trip back I got to enjoy some of the beautiful scenery I had missed on the trip down. Got home about 3:00. I really had a great time meeting every single person and cannot thank FarmGirl, FarmMom and FarmDad enough for such a wonderful trip! I rode over to Mamaw’s with Ambulance Driver, Katy Beth and Gay_Cynic and we met up with everyone else. FarmMom brought out a dish of yummy looking battered fried meat chunks. “Yum, these are delicious. What are they?” I asked while popping a few more in my mouth. “I’ll tell you when you finish,” FarmMom replied. Turns out I had just had my first taste of the delicacy known as Rocky Mountain oysters. I tried some of Stingray’s excellent home-brewed beer and it was very tasty to say the least. FarmDad announced that dinner was served so we all grabbed a plate and loaded up on chicken fried steak, mashed potatoes, gravy, corn and bread. I consider myself a little bit of a chicken fried steak connoisseur. I have eaten chicken fried steak all over the country. I have gone so far as to have my mother-in-law freeze and fedex me some overnight. Just because. Unfortunately, someone is going to have to be dropped from my Top 3 Chicken Fried Steak’s Ever list, because FarmMom’s chicken fried steak blew them all away! * It is seriously on a whole other level. This is the One by which all others shall be judged. Seriously. After dinner, we all sat around and listened to stories and told jokes. AEPilot_Jim got a lap dance from Ambulance Driver, much to everyone’s delight. It was getting late, I was tired and OldNFO offered me a ride back to the hotel. It still took me another hour to wind down and fall asleep. *Just to be clear, my mother-in-law’s chicken fried steak is still on the list. Saturday morning, I went to the front desk to thank them for leaving the key out for me and get the wireless login info. Grabbed a cup of coffee and finally logged on to see what was happening. Snarky notified me that breakfast was in 30 minutes. Gay_Cynic said he was just a few doors over, so we all met up and headed over. I started to get really nervous as we walked across the street to the restaurant for breakfast. We walked in and I met FarmGirl, FarmMom, FarmDad, Amublance Driver and Katy Beth, ChristinaLMT, AEPilot_Jim, Labrat and Stingray, OldNFO, Breda, and Alan all at once! Just to be safe, the waitress hid put us in our own room and everyone chatted while we either waited for, or ate our breakfasts. Plans for the day were all set so we gathered in the parking lot where JayG even made a virtual appearance via cell phone. We drove to FarmHouse, loaded up our trucks and headed out to the range for a full day of shooting. 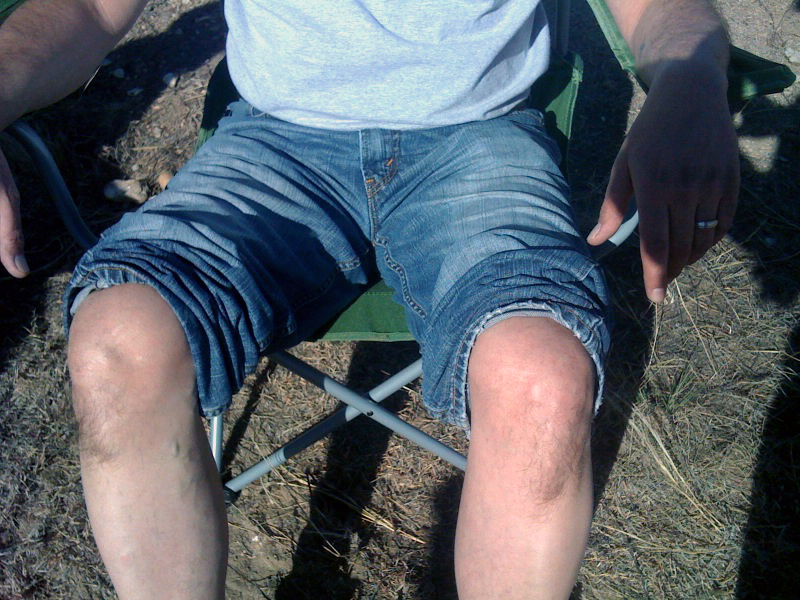 While we were talking and waiting for final range prep to be completed, people gathered round to get a glimpse of my legendary knee beards*. Soon afterwards Phlegmfatale and LawDog arrived. There were so many guns, I don’t remember them all. We shot at poppers, plates, and paper with handguns and at targets, tennis balls and tannerite with rifles. Everyone was wearing the shooter grin. At sunset, we packed up and headed back to town to wash up and meet back at FarmHouse for dinner.